PUT YOUR DROPS IN THE RIGHT WAY - aim for the outer corner of your eye. You can pull down your lower lid to create a little pocket for the drops to go into. If you're having trouble, try lying down - get gravity on your side! After the drop goes in, keep your eye closed for about thirty seconds to help it absorb properly. If you blink excessively, the drop will not get absorbed. If you place your index finger along the inner corner of your eye after putting the drops in, this closes off the tear duct and keeps the drop in the eye longer. Effectiveness of the drop will be enhanced and side effects will be reduced - the drop will stay in your eye instead of going to the rest of your body. DON'T DOUBLE UP ON DROPS - there is no need to put more than one drop in your eye. One drop is more than can fit into your eye, so a second drop will just run down your cheek. SPACE OUT YOUR DROPS - when you are taking multiple drops, wait 5-10 minutes between each medication. Otherwise, you will just be rinsing the first drop out with the second drop and you will reduce the effectiveness of your medications. 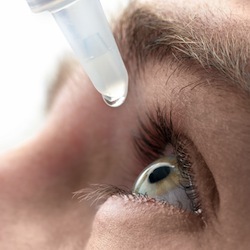 ASK YOUR DOCTOR - just because your doctor prescribed a drop for an eye problem you've had in the past, doesn't mean you can use it for the eye problem you're having today. This can be dangerous. For example, if you have an infection and you put in an old steroid drop, the infection may get much worse. If you accidentally use an old dilating drop, you may be stuck with a dilated pupil for weeks. If you are having a problem, come see us! KEEP TRACK OF YOUR DROPS - when taking multiple drops, it can be confusing and overwhelming. Make a chart to mark off when you use each drop. Bring the bottles in with you to appointments so you and your doctor can be sure you are using the correct medications. USE YOUR DROPS EXACTLY AS DIRECTED - don't stop your medication just because your eye is feeling better. Consult your doctor first. Sometimes stopping a drop too early can cause your condition to rebound. ALWAYS USE YOUR DROPS THE DAY OF YOUR APPOINTMENT - a common mistake is to skip drops the day of an appointment, thinking the doctor will have a better idea of your condition if you are off the drops. We want to know if the drops we've recommended are working. If you haven't used your drops that day, we may be unable to tell. You may even have to come back another day to reassess the effectiveness of the drops. NEVER HESITATE TO ASK - if you have a question about your medication, our doctors and technicians are always available to assist you. You can call us, 913-829-5511, or send us a message through the patient portal.